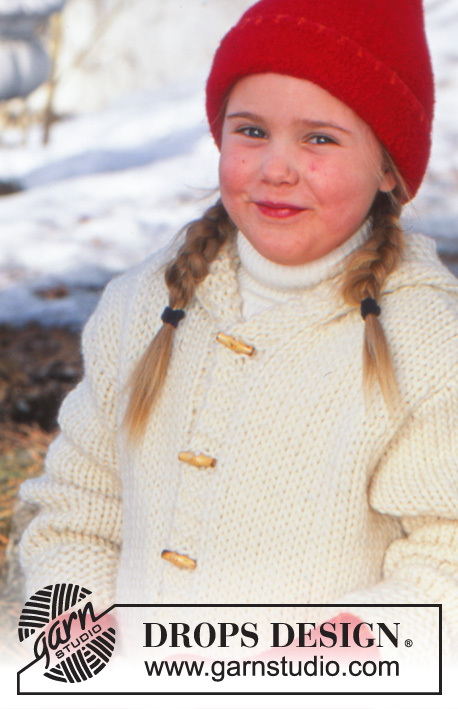 Go to original pattern for design DROPS Children 12-23. Size: 3/5 – 5/6 - 7/8 (9/10 – 11/12 – 13/14) years. DROPS duffel buttons no 520: 5 (6) pcs. Back piece: Cast on 41-44-47 (50-53-56) sts (incl 1 edge st each side) on needle size 9mm with Eskimo. Knit 4 rows garter sts and continue in stocking sts. Remember your knitting tension! When piece measures 11-12-12 (13-14-15) cm dec 1 st each side and repeat the dec when piece measures 22-24-25 (26-28-30) cm = 37-40-43 (46-49-52) sts. When piece measures 33-35-37 (39-42-45) cm cast off for armhole each side on every other row as follows: 3 sts 1 time and 1 st 0-1-2 times = 31-32-33 (34-35-36) sts. When piece measures 46-49-52 (55-59-63) cm cast off the middle 5-6-7 (8-9-10) sts for neck and dec 1 st on neckline on next row = 12 sts left on each shoulder. Cast off when piece measures 48-51-54 (57-61-65) cm. 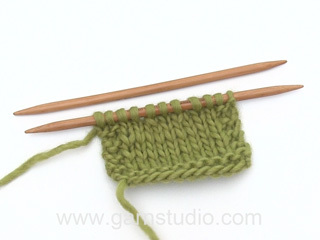 Sleeves: Cast on 20-22-22 (24-24-26) sts (incl 1 edge st each side) on needle size 9mm with Eskimo. 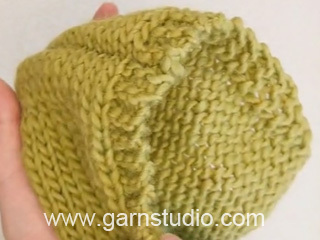 Knit 5-5-5 (6-6-6) cm garter sts and continue in stocking sts until finished measurements. At the same time when piece measures 7 cm inc 1 st each side on every 4.5-5.5-5 (5.5-5-6.5) cm a total of 5-5-6 (6-7-7) times = 30-32-34 (36-38-40) sts. When sleeve measures 28-31-34 (37-41-45) cm cast off for sleeve cap each side on every other row as follows: 3 sts 1 time, and 2 sts each side until piece measures 31-35-39 (43-48-53) cm. Now dec 3 sts each side 1 time and cast off remaining sts on next row. Sleeve measures approx 32-36-40 (44-49-54) cm. Pockets: Cast on 3 sts on needle size 9mm and knit garter sts. At the same time after the 1st row inc 1 st each side on every other row 3-3-4 (4-5-5) times (inc by making a yo after the first st on row, on the return row knit into back of yo) = 9-9-11 (11-13-13) sts. Continue in garter sts until pocket measures 11-12-13 (14-15-16) cm. Cast off and knit 1 more pocket. Hood: Sew shoulder seams. Pick up 30 to 40 sts round the neck (incl sts on thread) on needle size 9mm. Knit 1 row from the wrong side, 1 row from the right side, at the same time inc evenly to 40-42-44 (46-48-50) sts. Continue in stocking sts with 4 sts each side in garter sts. Cast off when hood measures 28-29-30 (31-32-33) cm. Sew hood tog at the top. 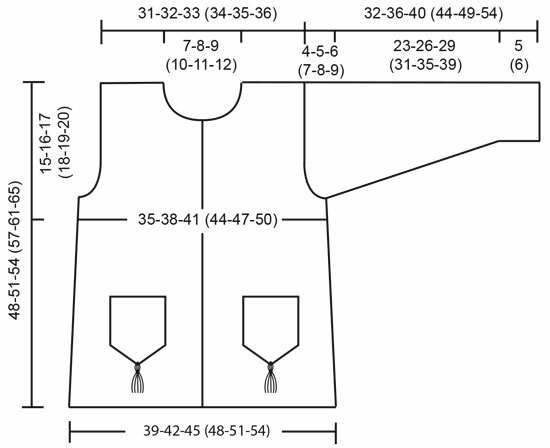 Assembly: Sew pockets to front pieces approx 31-32-34 (35-38-41) cm from shoulder seam and 7-7-8 (8-9-10) cm from mid front. Sew in sleeves. Sew sleeve and side seams within 1 edge st. Sew on buttons. Make 3 tassels with 10 threads measuring 18 cm each. Attach a tassel at the bottom of each pocket and one to the top of hood. Knitting Tension: Before felting: 16 sts x 20 rows on needles size 5.5mm in stocking sts. = 10 x 10 cm. After felting: approx 21 sts x 32 rows = 10 x 10 cm. Felting: Wash hat and mittens in washing machine at 40° C with 1 tbls of enzyme-free powder. Shape and leave to dry flat. Loosely cast on 99-108-117 sts on double pointed needles size 5.5 mm with 2 threads red. Remove 1 thread and knit stocking sts. Remember your knitting tension! When piece measures 27-28-29 cm insert 9 marking threads with 11-12-13 sts between each thread. 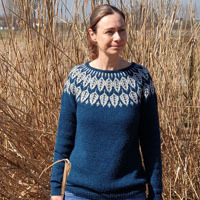 Now dec 1 st to the right of all marking threads by knitting tog 2 sts on every 6th round 5 times = 54-63-72 sts. Now dec 5 sts evenly on every 6th round until there are 14-18-22 sts left on round. 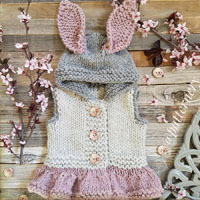 Knit 5 rounds and then knit all sts tog 2 by 2. Cut the thread and pull through remaining sts. Sew. 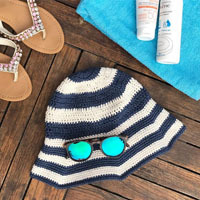 The hat measures approx 66-70-74 cm. 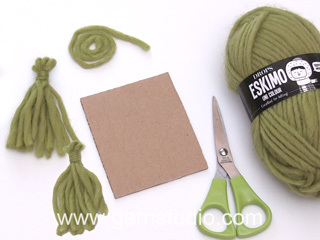 Tassel: Make a tassel and attach to top of hat before felting. Each tassel = 10 threads rust + 10 threads red each measuring 30 cm. Felt the hat and fold the bottom 5 cm towards the right side before leaving it to dry. Sew rust diagonal sts around the folding edge. Cast on 28-32-36 sts on double pointed needles size 5.5mm with 2 threads red. Remove 1 thread and knit stocking sts until finished measurements. When piece measures 7-8-9 cm inc 4 sts evenly on round = 32-36-40 sts. When piece measures 13-15-17 cm knit next round as follows: knit 1 st, put 5-6-7 sts on thread for thumb, knit remaining sts. On next round cast on 5-6-7 new sts over sts on thread. Continue in stocking sts. When piece measures 8-11.5-14 cm from the thumb opening dec 4 sts evenly on every other row a total of 5 times, then on every round 1-2-3 times = 8 sts left. Cut the thread and pull through remaining sts, sew tight. The mitten measures approx 26-32-36 cm. Thumb: Put the 5-6-7 sts from thread back on needle size 5.5mm, pick up 5-6-7 sts behind the opening and 1 st on each side = 12-14-16 sts. Knit stocking sts round on needles. When thumb measures 5.5-6.5-8.5 cm, knit all sts tog 2 by 2, cut the thread and pull through remaining sts, sew tight. 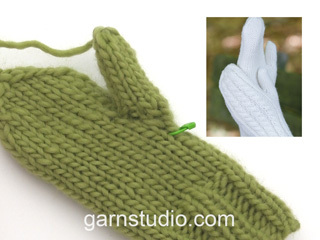 Knit another mitten but with the thumb on the opposite side. 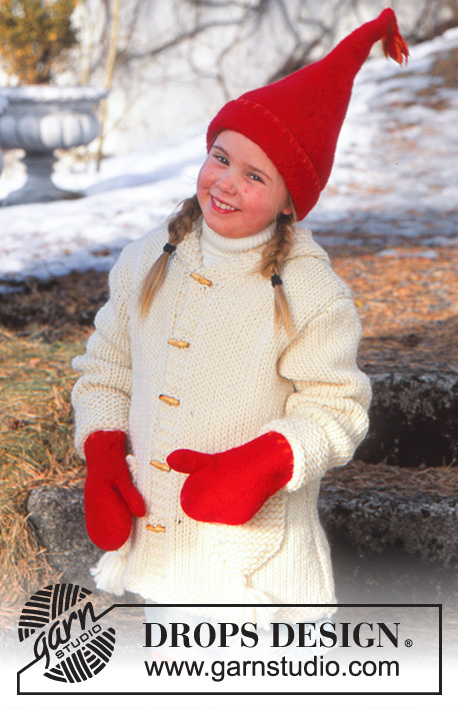 Felt the mittens in washing machine – see above – and decorate the mittens with rust diagonal sts around the upper edge.